I had the best best BEST lunch at a fast food restaurant today. 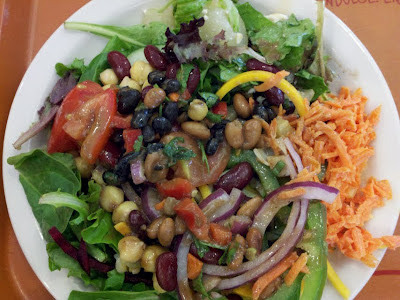 It's a chain called "Sweet Tomatoes" which main feature is a salad buffet. You pay $8.79 and get unlimited salad, homemade soup, and they even have a bakery with breads, pizza and some pasta. They offer both vegetarian and non-vegetarian options. They even have a dessert bar included. What more can you ask for? Why isn't this chain EVERYWHERE?!?! If you add vegan options to the mix, it would undoubtedly be the perfect spot. Convenient, fast and affordable, oh and yes, healthy too. Two thumbs up for "Sweet Tomatoes"!